I hadn’t thought about that letter in years. Not sure why I did now. But I wanted to find it. I knew where it was—in a scrapbook, in a plastic bin—deep in the loft of the cabin. 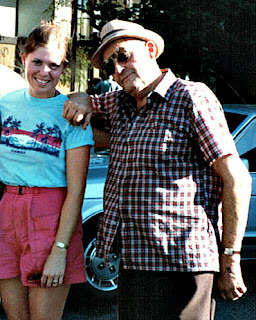 It was the only letter I ever received from Grandpa—he wasn’t a letter writer. It was neatly typed on white crinkly paper. At the time he’d sent it, I’d been dealing with some of life’s hard realities, and even though they were adolescent challenges, Grandpa knew it mattered to me. Now as I read his words decades later, they sounded just like he used to talk. Some humor mixed with wisdom. His wisdom was well-earned, but he didn’t earn it in school—his classroom days ended at age 13 when he took over the wheat ranch operation for his widowed mom and five remaining siblings. This was back when horses pulled the plows and harvester. Hard labor. Grandpa’s advice: “bad things don’t last as long as good times.” For a man who’d faced years of adversity, he knew hard times and how to appreciate good times. 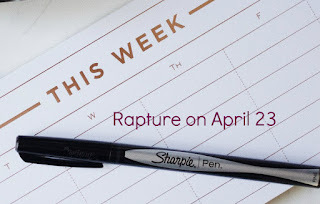 Numerologist David Meade predicts that Christians will be raptured on April 23, 2018. He says the stars are lining up perfectly. My astronomy knowledge is mostly limited to spotting the Big Dipper, so I don’t really have a clue what Mr. Meade is talking about. But he says that on April 23, the sun, moon, and Jupiter will be in the constellation of Virgo. So? Meade suggests that Virgo represents the Virgin, and Jupiter is the Messiah. Another Bible numerologist, Mark Lane, agrees. He says Jupiter’s red spot symbolizes how the Messiah was wounded for our transgressions. Meade also warns that on April 23, Planet X will cause volcanic eruptions, tsunamis, and earthquakes. One should note that NASA says Planet X is a hoax.